As the revolution of Refugees continue to take its space all over Europe and beyond, Baden Württemberg and Bayern Refugee activist of The Caravan Network would undertake another round of Tour within Southern Germany to inform Refugees and mobilize their solidarity for the ongoing strike of refugees against all forms of Colonial Injustice. The necessity of the Tour aroused from the increasing persecution of Refugee by the German state through the legitimation and enforcement of discretionary lapses at all levels. 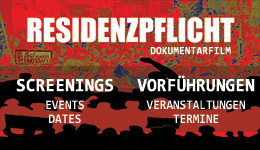 The Tour is expected to scandalize the situation of Refugees which involves forced accommodation in Lager, deportation, Restriction to freedom of movement (Residentzpflicht), Police brutality, racial profiling, discriminating mechanism through horrible packet food supplies and other forms of unjust control directed at further persecution of Refugees in this modern Century. The Tour is planned through Lagers in Baden Württemberg and Schwaben (Bayern) from April 26th to end up with a demo in Stuttgart on June 8th..
During the Tour will be spontaneous info events and flyer distributions to inform refugees about the ongoing actions, mobilize Solidarity and Testimonies for the Refugee Tribunal against Germany taking planned for 13-16 June in Berlin. The tour will witness exchange of experiences focused at breaking the Isolation of Refugees, liberating Refugees from their fear for Freedom and a call for joint solidarity against Lager, Resdenztpflicht and deportation Practices of the German State and all its allied with target to close down all deportation prisons. The Tour will continuously enforce Civil disobedience to denounce all forms of institutional racism and repression (i.e) the abnormal racial control and prohibition of Schwabish Gmünd Refugee Activists from paying solidarity to their fellow comrades in the Nördlingen Refugee Lager. This is a formal call and appeal for support from Networks and Organizations who support and show solidarity with Refugees struggles against Colonial Injustice and Refugee persecution. NEU ULM:	G.U NEU ULM.